The sun is fast dipping in the ocean of the sky; the enthusiasm fast rising among the sea of people. Our beloved Ganesha is on His journey Home. He will soon be immersed in a body of water which will take Him back to the place from where He arrives. The immersion is just the climax, there is more to the picture. Before the immersion is the farewell... a farewell that is grand, the best His fans can do for this larger-than-life deity that they adore. 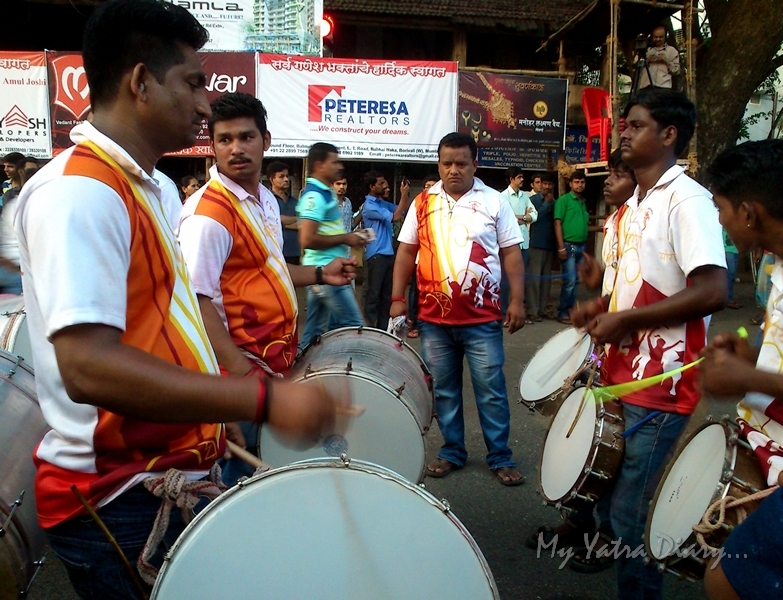 The drums are beating loud, the dances are ecstatic and the songs are hovering between the religious and the filmi. The festival tempo is high, the jaws - drooped. 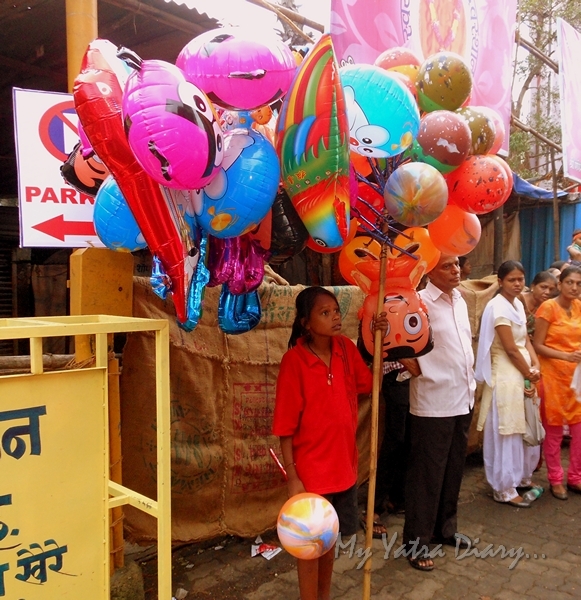 Exactly 11 days back, the same streets were draped in enthusiasm too, but of a slightly different kind. 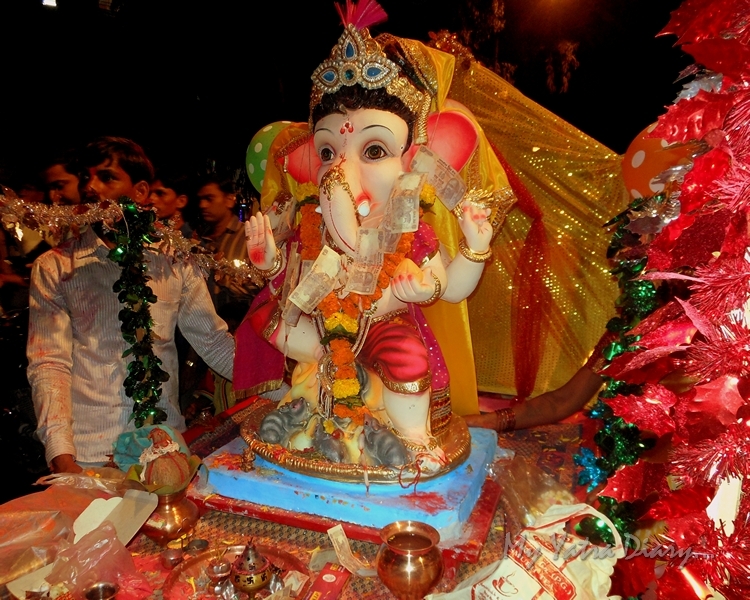 Then, there was an elated joy of Ganesha being welcomed in (Ganesh Sthapana). 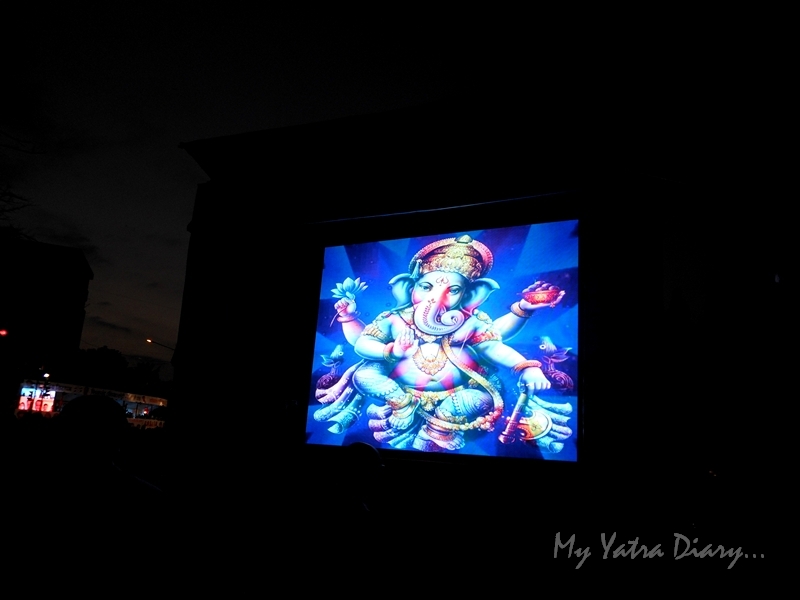 Today: there is melancholia mixed, that of Ganesha moving out colouring the mood. It is not very easy to say goodbye, to see someone close - go. Today: He is not only a God descended from the heavens, not just a larger than life figure of the legends and lore... but today, He is the common man, the aam aadmi, one among the crowds - out on the streets, in the open, waving His celestial wand of goodwill, blessings and benevolence to all. After residing comfortably for 11 days under temporary tented canopies or pandals, today, He chooses the sky as His only cover. The water as His Ultimate solace. He doesn't mind a pollution-free ride on a hand-drawn cart to the site of His immersion. He loves being created in an eco-friendly way. He is a devoted son. He loves adorning the natural gifts existent in this wonderful creation, those that transcend all social boundaries, those are His most likeable props. 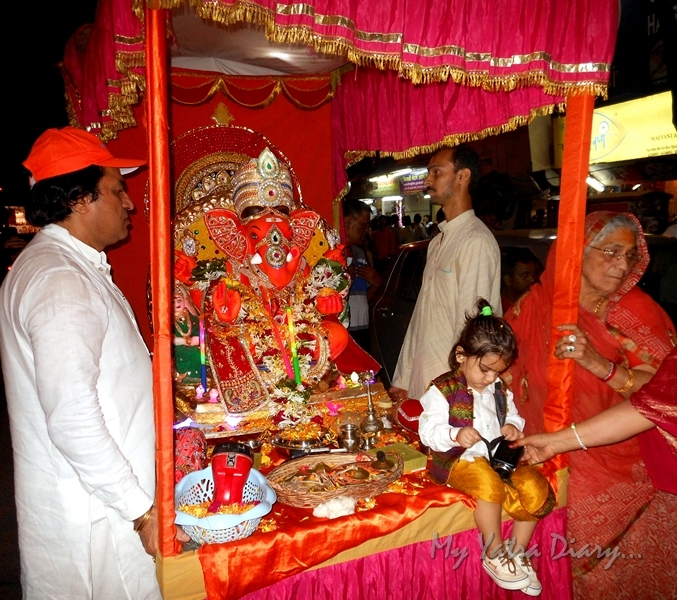 Ganesha riding in hand drawn cart. As the black of the night gets deeper, the swarm on the streets gets stronger. People from all walks of life are walking together. In this unity, the diverse social boundaries that exist go out of focus... merge. Peace envelops this diversity. What is in focus, today? 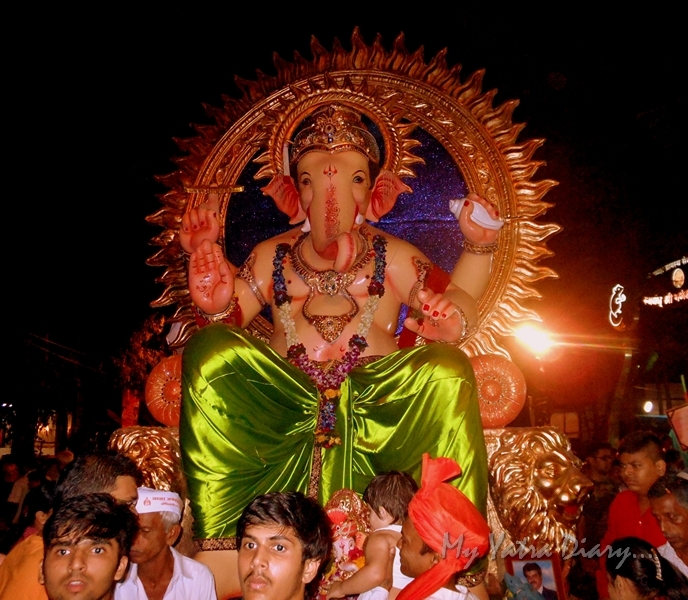 Only Bappa. Most of the people are crazy to get a picture of their superstar. Pictures are their memories of the happy celebrations with the birthday boy Ganesha - of the sweet melody of the arti or prayer, of gulping down extremely delicious modaks or the sweets or of pampering Him with flowers, incense sticks, coconuts and garlands - wisps of devotion freezed in their hearts. 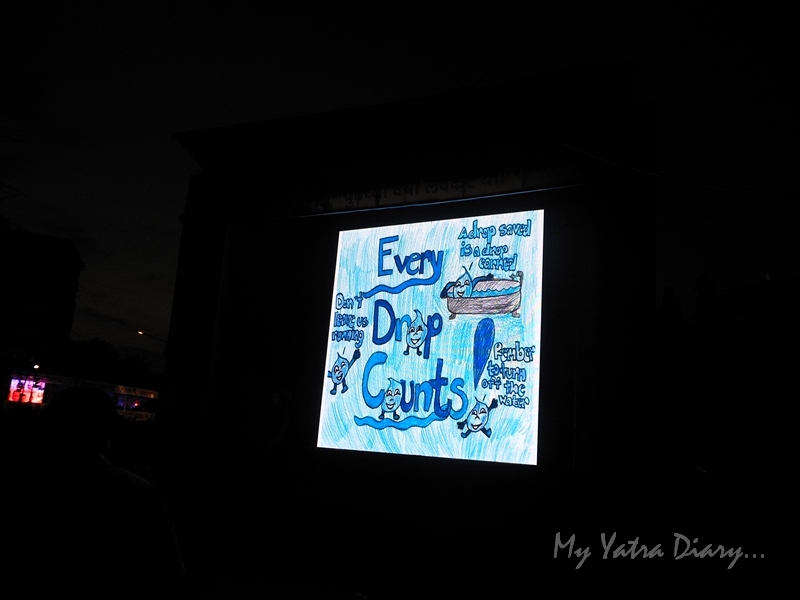 If crowds are too thick to penetrate, there are facilities of E-darshan too: big TV screens on the streets so that everyone is taken care of and no one looses His sight in the chaos. 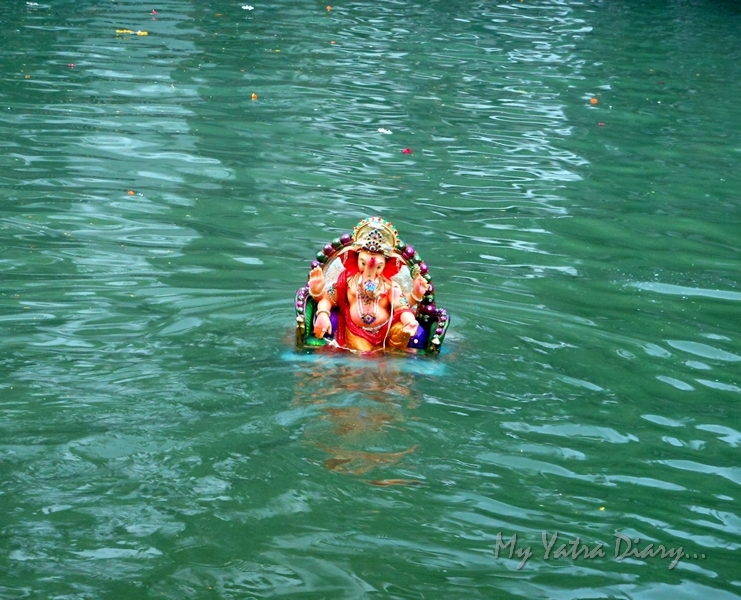 Swayumbhu Siddhivinayak Ganesha temple in Borivli, the temple that also houses an artificial lake. 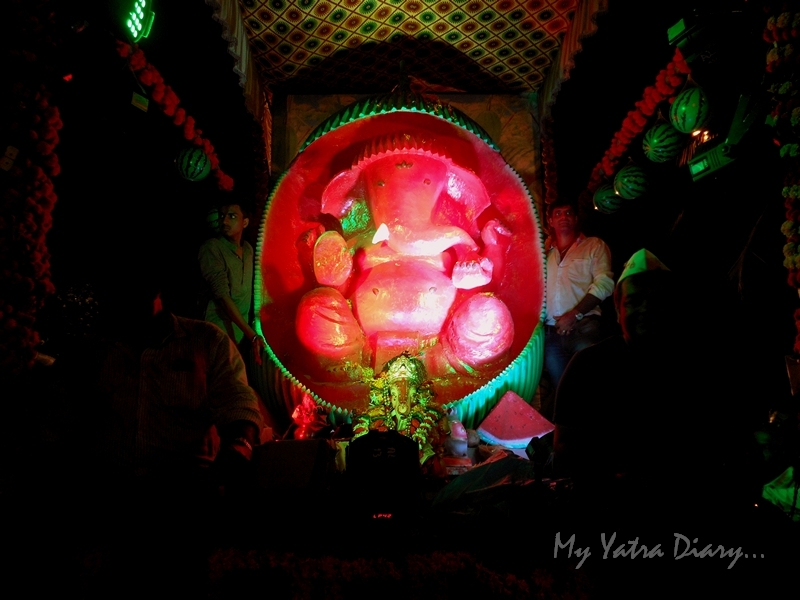 Take the blessings of E-Bappa! Beneath the twilight sky, all inhibitions are dropped so that the conversations can flow free... He is looked lovingly in the eye and spoken to, softly within the fields of the heart. Yet, be like a little child: wonderfully curious and actually free! 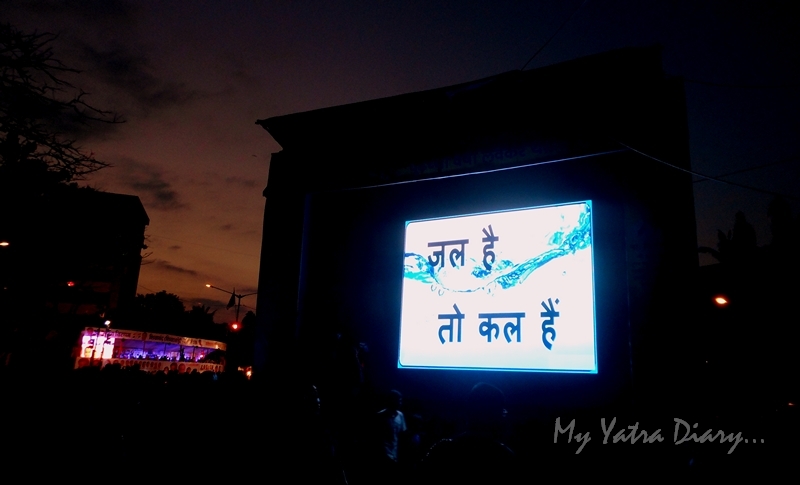 Care for Mother Nature: Be friendly with the eco-system, save water. 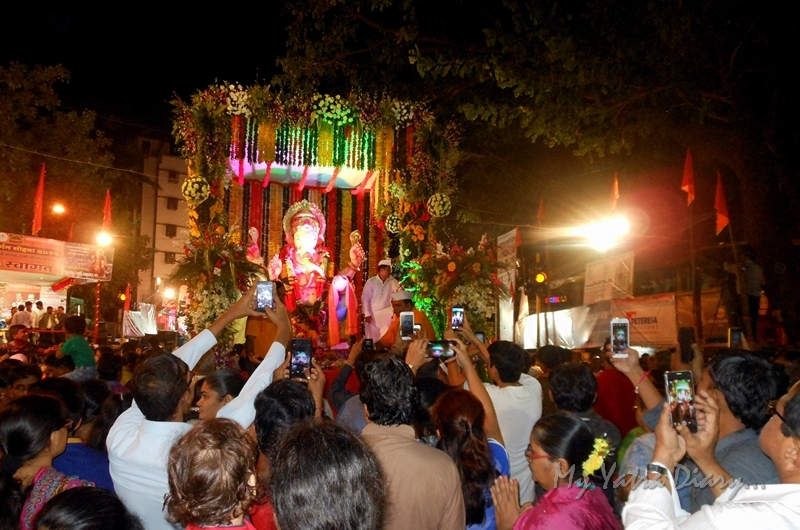 Ganpati Visarjan - Lord Ganesha's Journey Back Home. 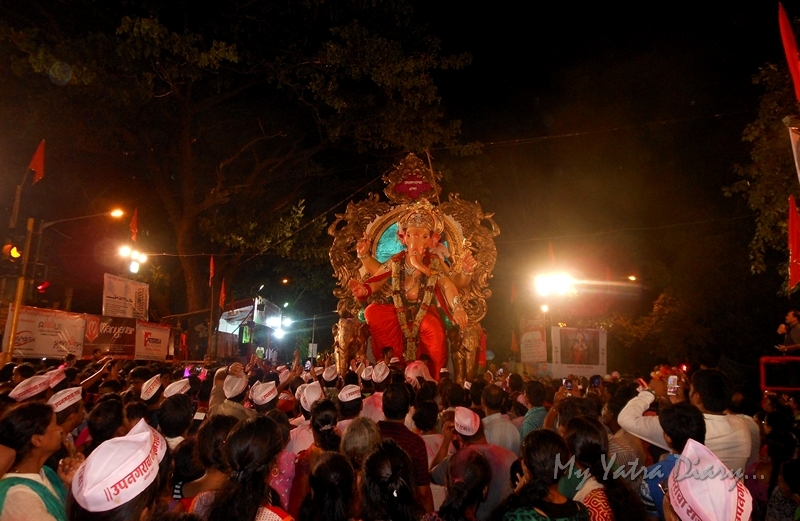 Ganesh Visarjan: Close up with Ganesha. 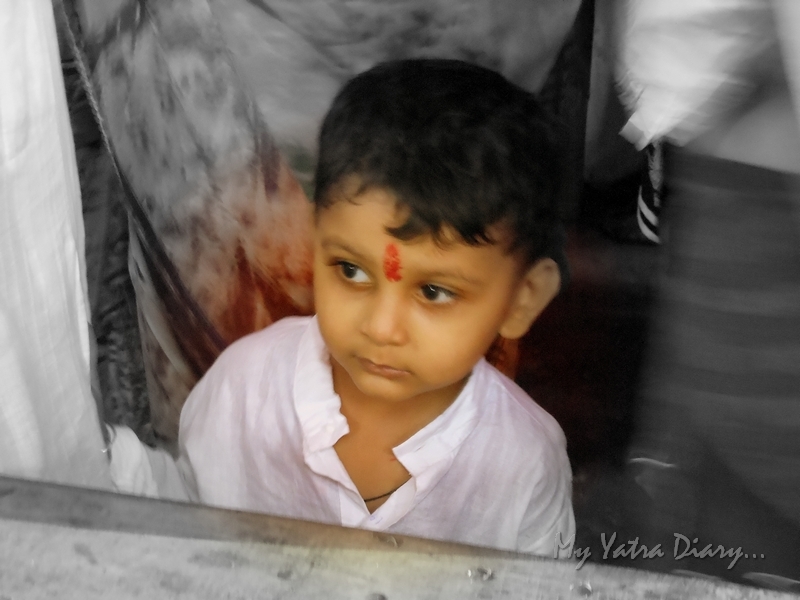 Am a big fan of the pictures you click Art :-) Cheers! Very nice series of post. 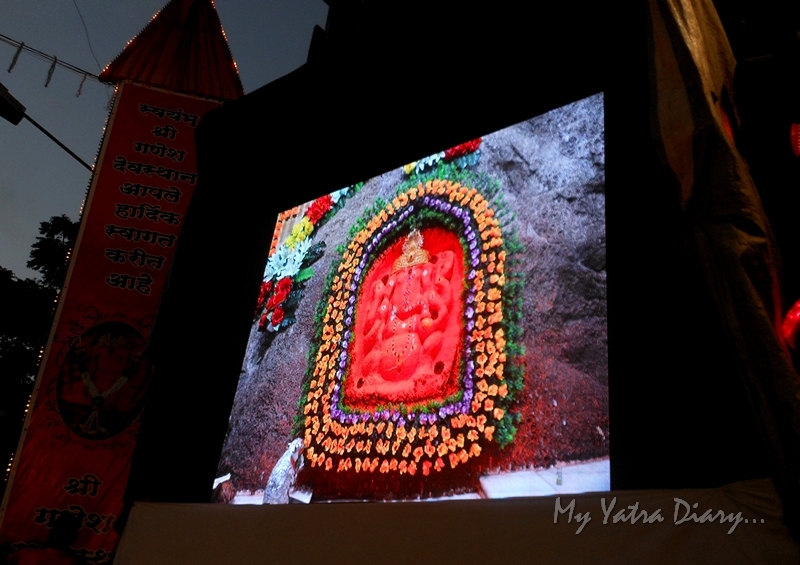 Beautiful pictures of the grand festival. 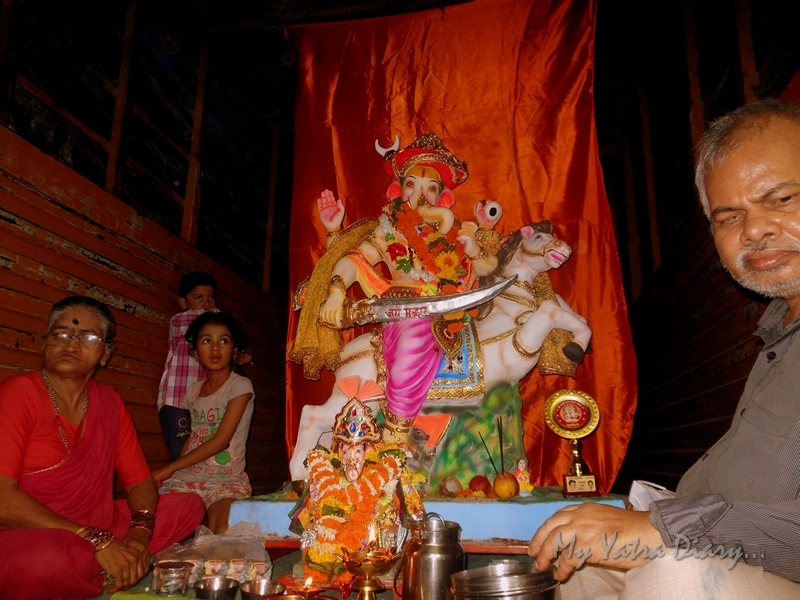 Ganpati Bappa Morya Pudchya Varshi Laukarya. 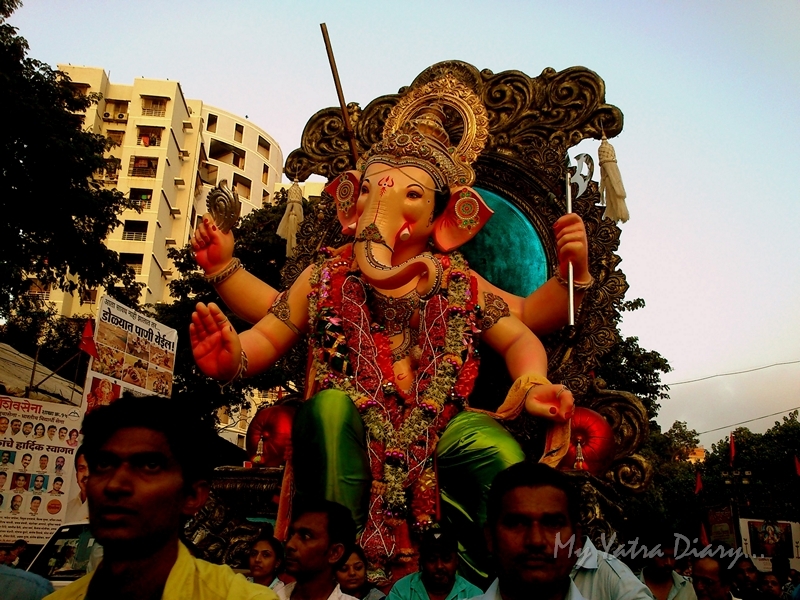 How I miss the grand celebration in Mumbai!! 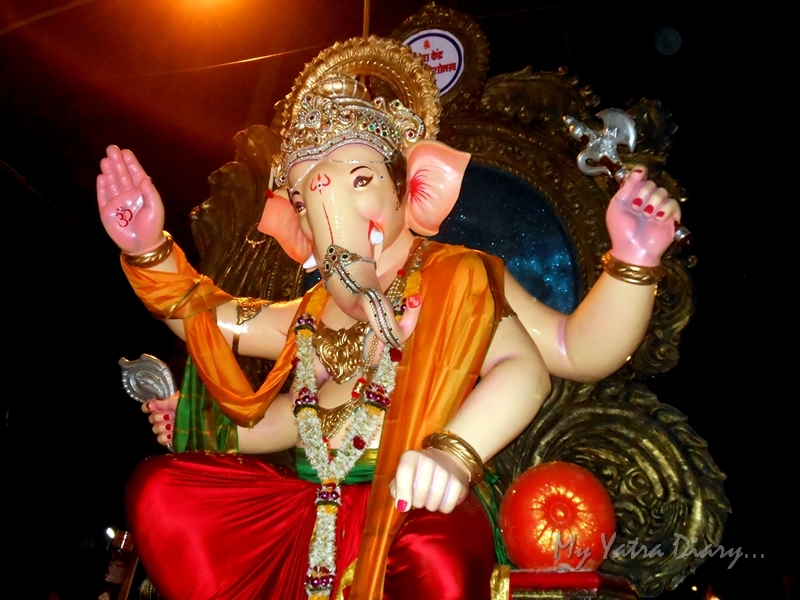 Awesome photos, Thanks for your Ganesh Utsav photos & all posts.